Note that this is a speculative post brought on from a rumor. What was that rumor? That Codex Genestealer Cults will allow the looting of PDF vehicles like the Leman Russ and Basilisk. The other grey beards here, will remember the old days of the 3rd Edition codex, when Orks could do EXACTLY that. But this post isn't about them sneaky Genesnatcher Fings! This is the Ork forum after all! Regardless if that rumor turns true or not for the GS (find out this weekend), the question I'm here to ask is if Orks regain the ability to Loot Armies of the Imperium vehicles, what would you want to take?! I'm personally conflicted, I remember the fun my old school Looted Leman Russ was, but the thought of Ork Paratroopers coming out of a Valkyre (or even better a Flyer wing of Valkyres) brings that green to my heart. Naturally I'd convert the heck out of it, and should GW ever see the brilliance of allowing Looted Vehicles again they could release a simple Ork Konversion sprue to go alongside any of their standard kits, although at that point its wishlisting on top of wishlisting. So what would you Loot? Land Raider, Corvus Blackstar, Baneblade (and variants), Drop Pods (though I would prefer rules for Roks instead). Yes I would re loot a land raider. The last two I had I repurposed into other models as the looted wagon rule just didn't fit the look. Imagine, a squad of 15 Ard boys moving across the landscape unscathed in an assault vehicle. OH the joy! Then I would loot flyers. I would love to have a full wing of necron night scythe transports, and a monolith that teleport the boys into combat. Just too cool. My personal favourite was the ability to loot imperial war gear for my meks. Being able to take a graviton gun to bring a building down around some marines always made me laugh maniacally. Looting a knight would be sick. I actually saw a converted ork knight on eBay a few weeks ago and it made me drool. Now why didn't I think of that? Looting knights.... Hmmm the eldar have a pretty cool knight that might definitely be worth looting (drools and has to wipe off keyboard). To be honest I hadn't even thought about the Baneblade and variant looting. 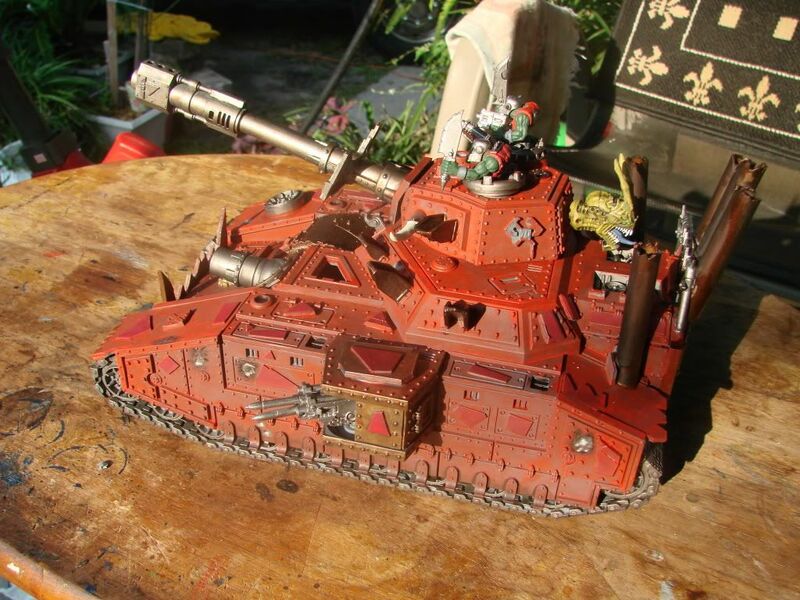 Anybody know if we still have access to the Skullhamma, the Orkified Baneblade from the original Apocalypse 40k book, or was that squatted? As for Roks, maybe its me, but the fluff for Roks NEVER sounded like Drop Pods to me. Yes they are asteroid weapons that are 'dropped' from orbit, but in the fluff of Armageddon when they first showed up, they were utilized more as strongholds armed with Tellyporta arrays and gobs of weapons instead of a mere delivery system like a Drop Pod. 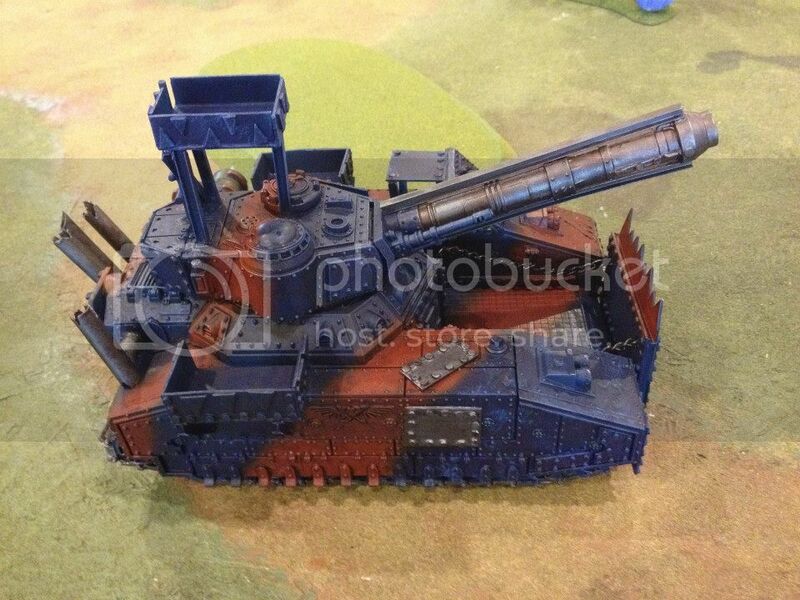 To me, a proper Rok would be a Fortification with automated fire weapons like a Bastion PLUS let an Ork unit within 6" to be removed from the table and deep strike anywhere on the board AND/Or allow Reserves without the Deep Strike rule to arrive within 6" via Deep Strike without scattering. Where was I for that?! Seriously, I don't remember a way that we could steal grav guns. We technically can take Imperial Knights, we just have to keep the Orks and the Knight 12" away during deployment (and ideally 6" away during the entire game to avoid One Eye Open). A relatively easy thing for Trukker armies, not really feasible for Footsloggers though. I'm not proud of it, but I've contemplated scratchbuilding a Knight Crusader. Haven't built it because I'm still so personally opposed to Knights and I'm also not generally for any model that is almost 1/4th the points of my game. After being asked to brainstorm some conversion ideas for how to scratch an Exorcist tank, I'm actually wondering why we don't see them more often. 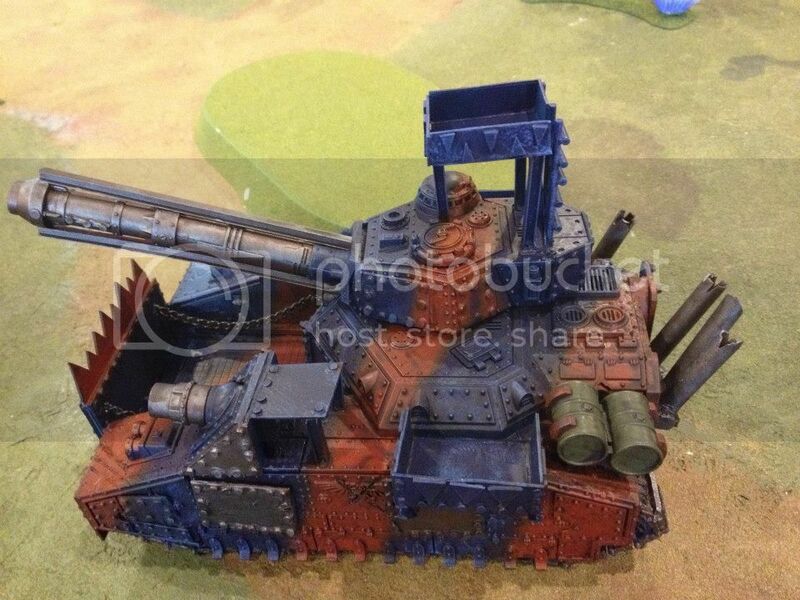 Sure the SoB or Soritas army is an unsupported joke, but the Exorcist tank is actually really solid and that randomness without [obscenity deleted]-ness is something I miss about Orks. Back in the day, I think Dark Millennium era, Blood Axe armies could take imperial wargear. That was also the time I was also able to ally with imperial guard, before allies rules came about in sixth. As for knights, you're right that we can take them as allies, but that doesn't seem orky. There should be looted rules like "Don't Press That" to make them fit. We do have the mega dread I suppose. Hence my comment of preferring actual Roks to looted Drop Pods. Ideally, in my eyes, they would do pretty much what you say, except they would start in Reserve and arrive via Deep Strike like a Drop Pod, carrying a full load of up to 30 Boyz along with the big gunz and tellporta. However, instead of the safe podding style of the Beakies, the Roks should be able to crush stuff (similar to those big burrowing Tyranid things that damage stuff when they Deep Strike in). Of course, if we also had smaller Roks falling alongside it, with just gunz and some boyz, all the better. We don't have to take them as allies, simply ork it up a bit so it is a looted knight. It could "count as" a meka or mega dread, or in friendly games have the same stats as listed in the relevant codex, but be driven by an ork big mek or nob. As for a rok, that is why I want to loot a necron monolith. Telly porting boys around would be a real hoot. Of course there would have to be an orky consequence in there somewhere, something like if you roll a 6 then the boys are back in reserve or your opponent gets to place them... Then the weapons that come with the monolith would have to orkified, or replaced with something from the ork codex like grot guns or snazguns, etc. etc. etc. I also like the ork junka rules from IA8. Makes looting rhinos a lot more fun. The looted wagon rules are kinda lame, while the junka rules are still fun. If the orks were to get rokk drop pods, I think it'd be fun if their mechanic with deepstriking on units worked like the Mawloc. Did an attack, and if that didn't clear the target area, they mishap. Way back when I played 40K I looted a Baneblade. One of these years I'll have to put it back on the table instead of letting it grow dust. I too looted a baneblade, made it my skullhamma (gotta love a fast super heavy. I looted a land raider years ago...repurposed it for a battlewagon, before there were models. I would one of those great big Tau flyers and cram it to the gills (heehee) with boyz...or, possibly a titan...gargaunts are all well and good, but come on...void shields people (figuratively speakin' of course...).